Picked this guy up for my wife last season. It was originally a demo bike for Specialized HQ. We have put around 20 hrs of ride time on it. Its got some scuffs and scratches from its demo days, but we haven't crashed it at all. Almost everything is original except for brake-pads, grips, seat and stem (I have the original seat and stem if you want to switch). Part spec: https://www.specialized.com/us/en/stumpjumper-fsr-expert-650b/p/106983?color=195936-106983 grips: DMR deathgrip Seat: Specialized Myth Stem: Cannondale 70mm Pedals: DMR V6 Shipping not included. Text is preferred. Rumors are we might see a new enduro this year hopefully along with a new demo. We’ll just have to wait and see. Posted in "When are brands going to give 27.5 bikes some love?" The ripmo was the first thing that came to mind even before I opened the article. It was ment to be! The big S wins again. They secretly wanted their patent to expire so that every unique company eventually gets sucked into the Horst link black hole where there will be no appeal to leave your Stumpjumper. 600lbs fox spring included. Probably has only 50 hours of ride time. 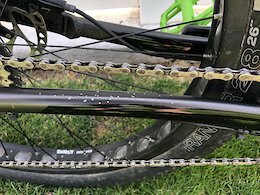 Specialized Stumpjumper Comp 29 Update on shock! Update! Just sold the CC DB coil. I am willing to spec a RS Super Deluxe or Fox DPX2 Factory for any buyer. Must pay upfront before I order shock. If you want this bike w/o a shock I will do $2000. This guy has been one of my favorite bikes. One of the most playful 29ers I've ridden. I'm planning on going carbon next season. Never been crashed!!! Excellent shape. There are a few cosmetic scuffs and dings from transports and rocks. I put the lizardskin downtube protector on it when it was brand new. Black smudges are from the tailgate pad. almost all of them are on the protector. A small chip of paint came off on the downtube towards the top. It just peeled off on its own. I just put some new upgrades on (only have been ridden twice) including shimano metallic brakes pads, Specialized Hillbilly 29x2.6 grid front tire, fabric grips. Non-stock spec list: Front tire: Specialized Hillbilly 29x2.6 grid Rear tire: Specialized Butcher 29x2.6 grid (original front tire) Brakepads: Shimano metallic pads Seat: Cromag trailmaster dt Grips: Fabric Silicone grips Everything else is original spec: https://www.specialized.com/us/en/mens-stumpjumper-comp-alloy-29/p/154962?color=253548-154962 I am happy to cover shipping for full price payers.